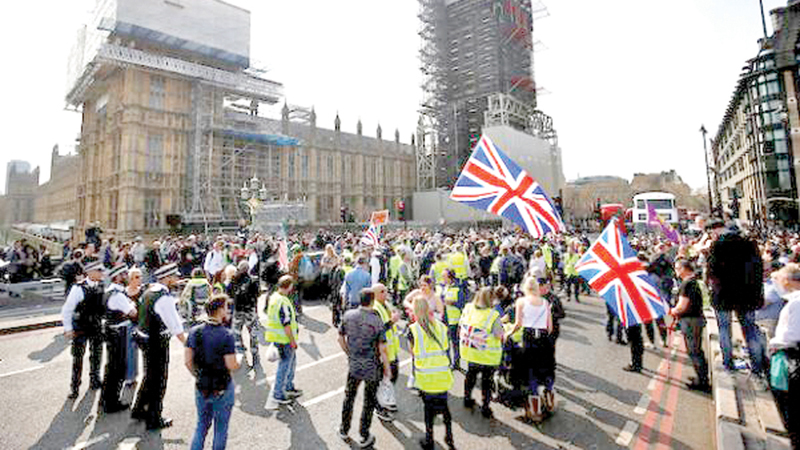 Pro-Brexit protesters wearing yellow vests, the symbol of the anti-government movement in France, gather in London on Saturday. UK: British Prime Minister Theresa May is considering a possible fourth attempt to get her Brexit agreement through parliament, faced with the growing risk of a chaotic no-deal exit in less than two weeks. MPs are due to gather again on Monday to consider possible changes to the deal that could ensure it is adopted. Lawmakers on Friday resoundingly rejected May’s deal, although by a substantially lower margin than on two previous occasions in January and March. The withdrawal agreement allows for a long transition period which would temporarily maintain the status quo to give individuals and businesses time to adapt to the future UK-EU relationship. Three years after Britain voted to leave the EU in a historic referendum, the process is deadlocked by a stand-off between the government and parliament. “Brexiteers” in May’s party oppose the deal because they believe it does not go far enough in severing ties with Brussels, while “Remainers” want closer ties with the EU, like Norway or Switzerland. Some would prefer to see Brexit stopped altogether. MPs have repeatedly rejected a “no-deal” outcome, fearing catastrophe if Britain severs ties with its closest trading partner with no plan. However, this remains the default legal option.